← Political leaders, “the vision thing,” the federal shutdown, and the national interest. As human beings, to varying degrees, we share a common impairment: we constantly struggle to hold a thought. That attention deficit disorder is hardwired in our DNA; it confers a certain survival value to all creatures living on a constantly-changing real world. Each year’s annual rhythm of holidays and other special occasions both recognizes this and provides opportunities to cope. Once a year, New Year’s Day helps us remember that each day is a new beginning, with fresh potential. Once a year Thanksgiving reminds us that we daily have many reasons to be grateful, instead of feeling anxious or needy. Memorial Day, the Fourth of July, and Veterans Day give us opportunity to focus on the continuing debt we owe others for their service and sacrifice to the country. Christmas and Easter, and other days like them, keep us in touch with abiding inner notions of the power of love and forgiveness in our lives and remind us they are not fragile constructs of our own making but robust realities that stem from a Higher Power. Martin Luther King Day is no different. It focuses on a single man, in the same way that Presidents Day honors George Washington (and Abraham Lincoln). But really it encourages reflection on the larger set of ideas he stood for and articulated: equality, justice, inclusion are the necessary starting point, the foundation, for confronting the problems we face. It’s not the other way around. To first attempt to end poverty and unemployment, provide health care and education, maintain peace domestically and internationally, protect the air we breathe, the water we drink, and the ecosystems we depend on? And only then turn to the “luxury” of addressing fairness, freedom, enfranchisement, and goodwill? By contrast, the promise is, if we relax (it takes effort to sustain prejudice and hate, to exclude others, to repress those unlike us), we’re likely to discover that jobs, good schooling, and public health; an end to terrorism and war; a verdant planet that can sustain us – all that we desire – will come along as collateral benefits. If we seek first to serve, rather than benefit, we’ll discover we’ve really “put ourselves first,” “made ourselves great again,” in the process. 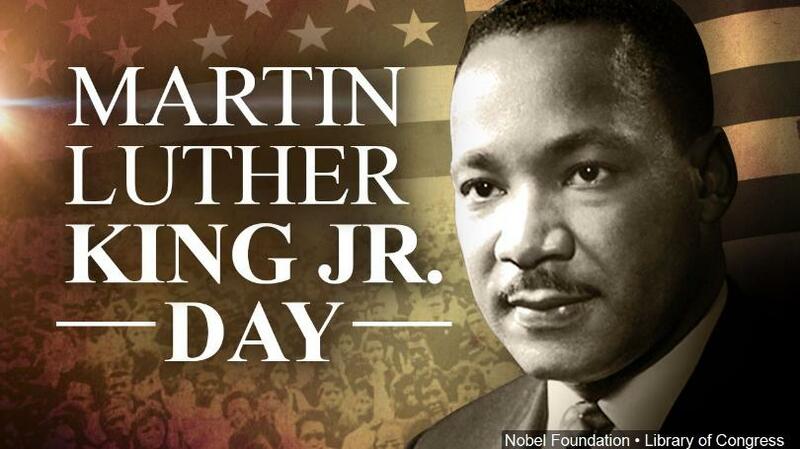 Read the text of Dr. King’s “I have a Dream” speech in its entirety and/or watch the video. Second/lastly, you and I might translate our reflections into acts of service. The origins of the holiday, established in 1983 and first observed in 1986 by President Ronald Reagan unsurprisingly have a complicated story. But in 1994 President Bill Clinton added to it, signing into law the King Holiday and Service Act, inviting us to make the holiday a national day of citizen action volunteer service. Reflection? Action? Together, they can make for a great day.